Today I rode up Mount Hamilton, but that wasn't the plan. The plan was to ride, for the first time, over Hamilton, then around to Livermore and back. Toward that end, I drove up to the start of the ride, since it was going to be plenty long enough already. I got on the bike at about 9:30, and while it was cool, I figured it would warm up. It didn't. In fact, the higher I got on the climb, the colder it got. At the observatory clouds were rolling in, and the temperature kept dropping. I just wasn't prepared for that, and being unfamiliar with the route, I decided to turn around and head back to the car. So it turned into a normal ride up Hamilton. I can't really be too disappointed by that, can I? Since I didn't start at the actual base of the climb, this was a little longer than a normal Hamilton ride -- it came in at a little over 43 miles long, with 5000 feet of climbing. The most difficult kilometer, according to the terrain, was near the start of the last hill. According to me, it just gets more difficult as you near the top. Maybe that's the altitude? Yesterday I rode to the Corralitos Market for lunch. I got started shortly after 10, and followed a route I've done a few times before, down over Mount Madonna and then back on Eureka Canyon Road. This time I climbed up the very steep Mount Madonna Road. As usual I enjoyed the sights and sounds, particularly on Uvas Road and near the top of the Mount Madonna Road, where the dirt path runs among redwoods. The problem is that I'm not taking pictures. My fitness is improving a little, so I have fewer reasons to stop. And when I ride a familiar path, I find myself thinking that there's no need for another picture of the same wonderful view. That's got to stop. I need to literally stop the bike and appreciate the surroundings. Taking pictures encourages that. Otherwise this is just exercise, and not worth the time. I rode the whole way back in my middle chain ring (maybe a few hundred meters in the small ring, near the bottom of Eureka Canyon Road), partly for the added challenge but mostly because it felt more comfortable to be in a slightly higher gear. Perhaps a little more pressure on the pedals means a little less pressure on the seat, if you see what I mean. This ride was about 72 miles, with 5100 feet of climbing. The most difficult kilometer was in the bottom part of Mount Madonna Road, on the paved portion. The whole road is 2.4 miles with an average grade of 9.3%, but that kilometer averaged 10.9%. A good day out, a lovely lunch, but not enough pictures. Today I took a great, albiet familiar ride to Santa Cruz. 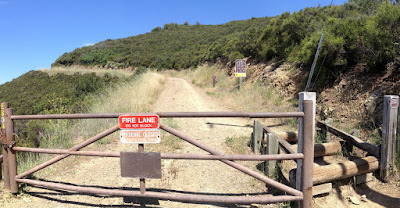 I got started at 10, and took the familiar route over Kennedy to Los Gatos, then down the Los Gatos Creek Trail to the Leniham Dam, then around the Lexington Reservoir and up Old Santa Cruz Highway to Summit. I went down the Soquel/San Jose Road to Capitola, then rode along the beach to Santa Cruz. I had lunch at Betty Burger, which is good but is becoming too much of a habit; I need to find another convenient lunch spot. After lunch I continued west to the Santa Cruz Boardwalk area, then headed north along the river. I was planning to take Mountain Charlie Road home, but tried a very slightly different route to get to Scotts Valley. Well, it was different for me, anyway; it might be the most common route. Basically I took Market until it turned into Branciforte Drive, then took that up to Granite Creek Road. I've done that before; the new part was the southern bit of Branciforte Drive. It was pretty, but I suppose the most interesting part of it is that you go by the Mystery Spot. I managed to pass by without getting a bumper sticker slapped on my bike. Once you get to the top of Granite Creek Road, you're basically at the intersection of Scotts Valley Drive and Glenwood. That's great, but lately I've been enjoying taking Bean Creek Road to bypass Scotts Valley Road and the lower, busier parts of Glenwood. I think in the future I'll try taking Branciforte to Glen Canyon Road, which arrives in Scotts Valley further south, near Bean Creek Road. But in this case, since I haven't been on that part of Glenwood Drive recently, it was a nice change. Glenwood has an easy grade, particularly on this cool day. Soon enough I was heading up Mountain Charlie Road, which had quite a lot of traffic on this weekday. Can this be normal? When I got to Summit I decided to take a left, to descend Bear Creek Road. The climb on this part of Summit, coming so late in the ride, normally kills me, but today I felt pretty good. I zipped down Bear Creek Road, and despite a long line of traffic coming up the road, wasn't passed by any cars on my way down. I went back home the usual way, but when crossing over the hill on Kennedy I tried doing the whole thing in my middle chain ring. I'm pretty heavy, and not very strong, so I normally live in the granny gear on any real climb. I made it, which marks a big step for me. I guess I'm building up a little strength to go with my (slightly) improved endurance. This ride was just short of 68 miles, with 5200 feet of climbing. I think I had a little more left in me, which is also a good sign. Today I rode up Highway 9 to Saratoga Gap, but took the long way to get there. Specifically, I climbed up Montevina Road. I started off about 9:20, and took Kennedy over to Los Gatos. 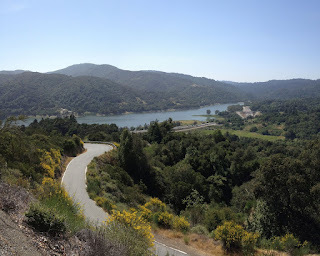 After climbing up to the dam, I took the dirt path between the highway and the reservoir to the Bear Creek Overpass, then backtracked on the frontage road toward Montevina. Actually the frontage road is Montevina, but you get the idea. I've never climbed Montevina before. I came down it once, after having climbed through El Sereno. But Montevina doesn't really go anywhere, so there's not much reason to use the road to get to somewhere else. That meant that it was one of the few major climbs around here that I haven't tried. Montevina runs through a neighborhood near the bottom, then becomes shaded and pretty as it climbs up the eastern face of the hill. Eventually it winds around to the southern side of the ridge and becomes more exposed. Today the weather was perfect, so the exposure wasn't a problem. Near the top the grade increases, until the last few hundred meters (of the paved road) are 15% or more. With the grade and the gravelly pavement, it's hard to keep from slipping. The gate sits at 2300 feet, but after that the road continues, unpaved. It climbs another couple of hundred feet. The Stanford cycling page has Montevina as a 3.5 mile climb with an average grade of 9.5%, but my program calculated 3.9 miles at 9.2%, so I presume the Stanford stats don't include the dirt section. The dirt road meets up with Bohlman, which drops steeply into Saratoga. I've never climbed Bohlman, which is reputedly one of the steepest, most difficult climbs around. Not really my cup of tea. Actually, even descending Bohlman is nerve wracking, especially on the lower section where the pavement is rough. Up to this point I was thinking that I'd probably just head back home, but I was feeling good so I headed up Highway 9. It was basically a perfect day, and I really enjoyed the climb. Once at the top I was thinking of just turning around, but again the weather was perfect, so I headed southeast on Skyline instead. The climb up to Castle Rock was great, and then it's basically a long descent past Black Road and Gist, most of the way to Bear Creek Road. At that point I was following the path of the Tour of California, heading southeast on Summit until it crossed Highway 17. I took Mountain Charlie Road to Old Santa Cruz Highway, then retraced my steps home. This ride was 54 miles, with 6300 feet of climbing. The most difficult kilometer was the last paved kilometer of Montevina, with an average grade of over 11%. On Monday I rode up to see the second stage of the 2012 Tour of California pass through the Santa Cruz mountains. The stage started in San Francisco, went down Route 1. It climbed Bonny Doon, went through Boulder Creek, then climbed Bear Creek Road to Summit. It went southeast on Summit, then down Soquel/San Jose to its finish in Capitola. I had scouted the route earlier, and decided that I'd hang out on Bear Creek Road. It was too far from the finish to be selective, but I figured that this late in the stage, the riders would be strung out a bit. And there were steep-enough sections to allow for pictures. I started out early, and rode up to the Summit Store for lunch. At this point it was cold, and even raining a little. After lunch I reversed the course, riding northwest on Summit, passing the last sprint and the Bear Creek KOM point in reverse order. I found my place on Bear Creek Road. Originally I was thinking about a steep section near 1500 feet of elevation, but in the end I watched from a less-steep section near 2000 feet, figuring that the peloton would have strung out more nearer the top. In retrospect, I should have continued riding, somewhere. It was a long, cold wait. There were hundreds of riders climbing the hill, some looking amazingly strong. I saw the distinctive banana-shaped, power-assisted bike of Bill Bushnell pass by. And then finally, after perhaps 20 motorcycle police and other official vehicles, the lone leader passed through. The peloton, climbing too fast for my camera. Chris Horner is near the center. He was followed a few seconds later (5 seconds, according to my photo timestamps) by the peloton, which passed by so quickly that I could only get two pictures. In fact, they were literally a blur. As they were passing by I couldn't recognize anyone. The peloton caught the break just past my position, but alas, that happened during a commercial on the television coverage so I didn't appear on the broadcast. As I had hoped, there were in fact stragglers. Some looked young enough to be my kid, and several were really suffering. The only rider I recognized as he passed by was Tom Boonen, two minutes down. The main peloton had passed by in silence, but these groups in the back were quite chatty. One guy from Garmin was introducing himself to a fellow American on a continental squad, and another (apparently English-speaking) rider was asking for something I didn't catch in completely un-accented Spanish. Eventually the last of the riders and team cars passed through. I slowly packed my stuff and rode up the hill, now following the path of the race. As I walked my bike through the KOM point, threading through cars, pedestrians and other bikes, officials were making the point that the course was still closed. I assumed that warning was meant for cars, since clearly the race was over, but as I passed skyline the officials more emphatically pointed out that riders were still on the road, so I pulled over. I was incredulous, but sure enough two guys came flying through a couple of minutes later. After that I very slowly descended Bear Creek Road, along with hundreds of others, and headed home over Kennedy. This was a 43-mile ride, with 3900 feet of climbing, apparently. It took over seven hours, but for more than 3 hours of that I wasn't moving. It was only the second time I've ever seen a professional race in person; the previous time was the final time trial in the 1992 Tour du Pont, won by Greg Lemond in Washington DC. Yesterday I got out for a pleasant mid-length ride up to Summit/Skyline, past Castle Rock State Park. I got out a little after 9, when it was still cool. I climbed up to Summit Road the usual way, this time taking Mountain Charlie Road for the last bit. Then I just headed northwest up Summit, enjoying the views and the shade. On the skinny part of Summit Road, between Bayview and Zayante, I rode across an enormous spider web, spanning the whole road. It had to be 10 feet across (bridging the trees, which partially covered the road), and another 10 feet high. The lowest point was perhaps 6 feet high, just over my head. Thankfully I didn't see the spider. North of Bear Creek Road, Skyline continues as a one-lane road. It climbs up to about 2400 feet when it meets Black Road, then it expands to two lanes and climbs up to Castle Rock State Park at about 3000 feet. After that point, it's mostly a descent down to Saratoga Gap at 2600 feet, then an immediate descent into Saratoga. Yesterday was warm, dry and almost entirely free of traffic, so conditions were perfect for a fast and enjoyable descent. After that it was home through Los Gatos and Kennedy. This was a little over 47 miles, and 4300 feet of climbing. The most difficult kilometer, identified by my little program, was the one that climbed up to the Lexington Reservoir. That doesn't seem reasonable; I need to debug, because Mountain Charlie Road is surely more difficult. Not a huge ride, but good exercise that didn't ruin me for the rest of the day. I started out just before 10, once it became warm enough to just wear a short-sleeved jersey. I went south on McKean, then Uvas road to 152, the Hecker Pass Highway. I rode up that skinny shoulder once again, up to its peak near 1300 feet. I then took the ridiculously steep Pole Line Road into Mount Madonna park. I went down the south side of Mount Madonna Road to Hazell Dell, then took that around to Corralitos. As usual the place was busy, with very little parking available, but strangely the meat counter and picnic tables were mostly empty. After lunch I returned on Eureka Canyon Road. I was struggling with allergies, and for the first time in quite a while I returned on Blossom Hill Road rather than Kennedy or Shannon. This ride was 76 miles, with almost 5000 feet of climbing. The most difficult kilometer was the first part of Pole Line Road, but despite the very steep pitches the whole KM came in at just 7%. The ride was much more draining than my recent rides, possibly because it was a little warmer and possibly because of the allergies.